I never used a mouse for my work on laptop, but then I thought to have one. Because I was using the touchpad of the laptop, and it was a bit difficult to use. The mouse is always better than using touchpad. I bought Lenovo N50 Wireless Mouse 2 days ago from an online shopping site. I received it today by courier. The mouse has diamond shaped design. I can easily rest my palm over it. It is a bit heavy, but that does not matter. It looks like a quality product. The following review of Lenovo N50 Wireless Mouse (Black) is based on my personal experience. I got Lenovo N50 for 743 Rs. (~ $12) in India. The price should be low in USA, but to my surprise the Amazon USA is showing the price tag of $23 for the same mouse. The price varies on different online shopping sites, but do not pay more than 900 Rs. (~ $15) for it. You can check the latest price on online shopping sites. The dimensions of Lenovo N50 are 8 x 4 x 2.5 cm. According to Amazon USA, the dimensions are 8.3 x 5 x 2.3 inches, but I do not think it is correct. The correct dimensions of Lonovo N50 wireless mouse are 3.14 x 1.57 x 1 inches. The mouse is in black color. Its weight is 191g. or 6.7 ounce. 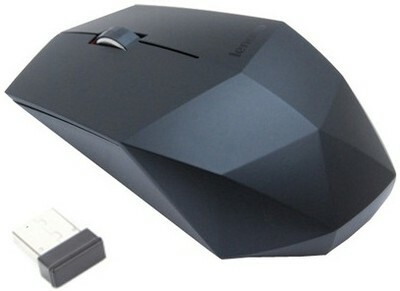 Lenovo N50 is a Wireless Mouse. There has to be a receiver to receive the singles from the mouse. Do you know about the nano receiver? It is a small receiver. You connect it to the USB port of your computer, just like a Pendrive. It automatically installs the driver software, when you connect it to your computer for the first time. It usually takes just 2 minutes to complete the driver installation. Your mouse starts working after the completion of the installation process. You can see the mouse and nano receiver in the image. There is an On/Off switch at the bottom of the mouse. Invisible optic, means no red light at the bottom when you use the mouse. There is a left click, right click, center scroll and center click. It uses 1.5 V AA battery. You can buy this type of battery from any retail shop. The mouse has diamond shaped design, which is very unique for a mouse. I actually bought this mouse for its look. Movement resolution is 1000 dpi. The design of mouse is great, it is comfortable to hold it in your hand and its performance is good too. The mouse has almost 5 stars on all the shopping sites by certified buyers. I recommend this mouse for anyone who wants buy a mouse with modern look. Next Post Why eBooks are Better than Paper Books?